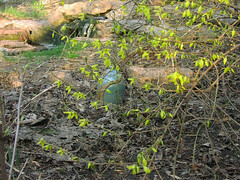 My new toad house, under the blooming forsythia and close to the pond. Thanks to a couple of days close to 80 F (with lows in the mid-60s), the flowering crabapples and lilacs have tiny squirrel’s ear leaves. The forsythia and the early daffodils (Rijnveld’s Early Sensation) are blooming, as are some tiny Labrador violets, volunteer crocuses, Scilla siberica, and some hyacinths I just bought on a whim on one of those warm days. I’m going through my annual delusion that planting right now would be wise. Even a damp day in the mid-40s like today isn’t discouraging me too much. I’m going to try to keep myself out of garden stores for at least another 2 weeks and focus on cleanup. The daylilies and strawberries need to be restricted from taking over half the yard, and the vegetable/sunflower garden that was under a concrete slab 2 years ago is in desperate need of some organic matter. Once that’s all done, then maybe I can consider putting in some cool-season stuff like chard and lettuce. I have a small backyard garden (also a Backyard Wildlife Habitat) in Oak Park, Illinois, USA. I am only a short distance from the shoreline of historic Lake Chicago and the continental divide between the Great Lakes watershed and the Mississippi river watershed. I’m enough of a science geek to think this is really cool, even if it does mean that the soil I’m dealing with is solid clay!